Then, being the crochet machine she is, my mom whipped up the six squares and passed them off to me for photography and assembly. (Pretty sweet deal for me, huh?!) I joined them together and stuffed the cube and then did some “quality testing” by letting my kids jump all over it for a few days. 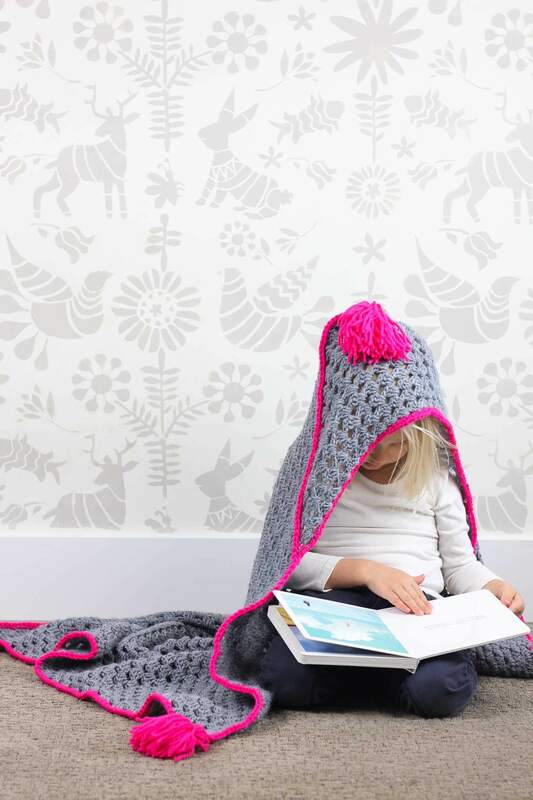 I always love seeing new and interesting ways to incorporate crochet into my life and home, but I just know that I never personally will spend $300 on the yarn to make something I could buy for $150 at a store. Yes, there’s something much cooler about it being handmade, but I think there’s something even cooler about it being handmade AND affordable. To that end, my mom and I decided to use Lion Brand Pound of Love yarn for this free crochet bean bag pattern and I’m thrilled with how this economical yarn worked out. At 1020 yards per skein, Pound of Love provides a serious load of creative potential for the price. 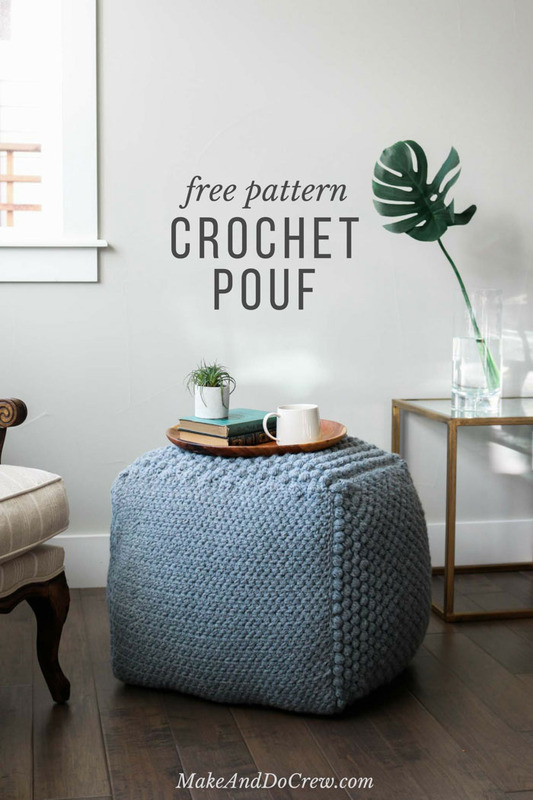 To achieve the richly textured look of chunky yarn, we decided to hold three strands together throughout, and even doing that, this free crochet pouf pattern only requires five skeins of yarn! 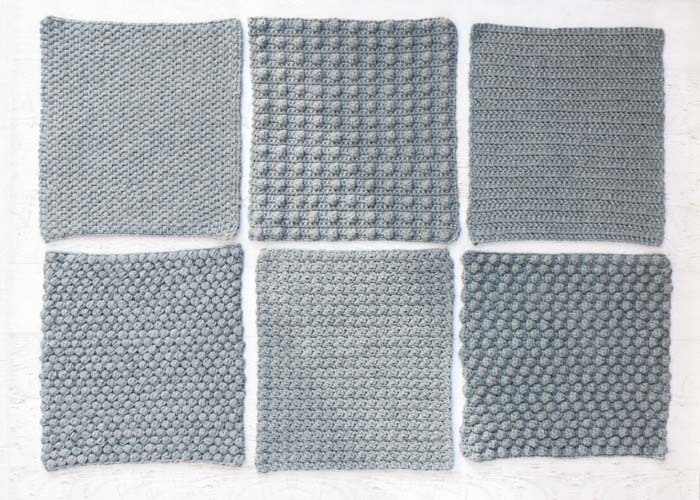 In Part 2, I’ll be covering how to block your squares, join them together and stuff the pouf. 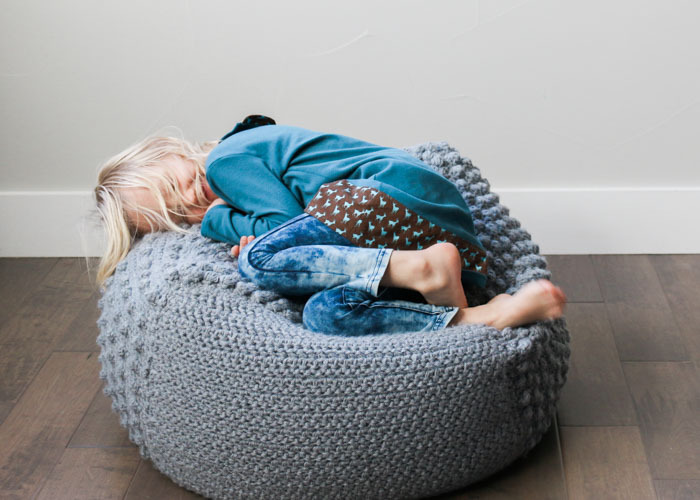 For a great start-to-finish overview of this free crochet bean bag pattern though, check out the :50 second video below. 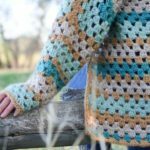 Then scroll down for Part 1 of the free pattern. I’ll be sharing Part 2 of this sampler pouf pattern later this weekend. Purchase the ad-free, printable PDF with parts 1 & 2 for $2.75 here. Get Part 2 of the free pattern here. Final pouf measurements will vary based on filling, but sample pictured is approx. 26” across and 23” tall, depending on how you fluff it. Gauge varies per square. More important than meeting a specific gauge is making sure the fabric is tight enough to limit stretch and that each square is the same size. • The pattern is written to create six 18” squares. 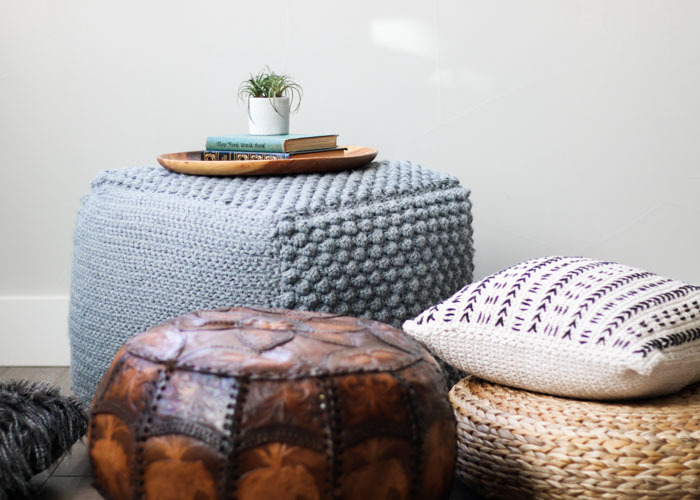 To make a smaller or larger pouf, use the stitch multiples listed to crochet six squares that are all equal in size. 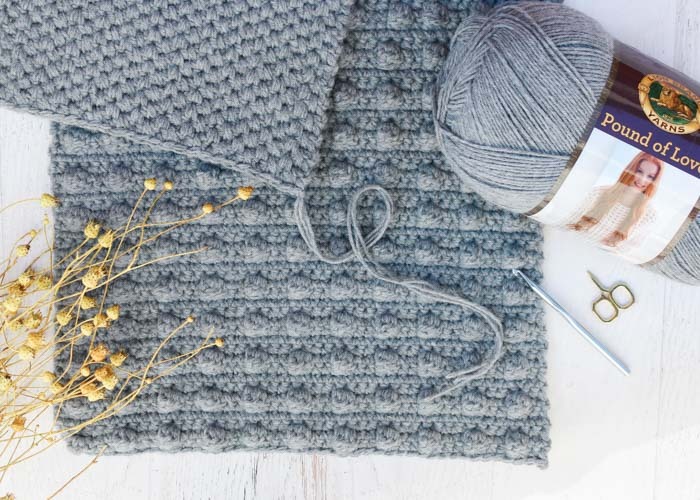 Make a square in each stitch to create a sampler pouf or choose your favorite stitch to make a pouf with uniform texture. • IMPORTANT: Pattern is worked with three strands of yarn held together throughout. Divide final skeins into multiple balls to create multiple working strands. Note: The spike stitches are created by inserting hook into the row below the working row when indicated. Take care to draw this loop up to the working row quite loosely to ensure a successful spike. Row 2: Ch 1, *sc in next sc, sc in sp below next sc; rep from * to tch, sc in ch-1 tch; turn. Repeat Row 2 until piece measures 18” square. Berry Stitch: Yo and insert hook in next st, yo and draw loop through, yo and draw through first loop on hook, yo and insert hook into same st, yo and draw loop through, yo and draw through all 5 loops, ch 1 to secure. Row 2: Ch 1 (counts as first sl st), sk first sc, *1 berry st in next sc, sl st in next sc; rep from * working final sl st in tch; turn. Row 3: Ch 1 (counts as first sc), sk first st, *sl st in top of next berry st, sc in next sl st; rep from * to end; turn. Row 4: Ch 1 (counts as 1 berry st), sl st in next sl st, *berry st in next sc, sl st in next sl st; from from * to last st, sl st in last st; turn. Row 5: Ch 1, sk first st, *sc in next sl st, sl st in next berry st; rep from * to end; turn. Repeat Rows 2-5 until piece measures 18” square. Cluster stitch: [Yo, insert hook where directed, yo, pull loop through, yo, pull through 2 loops] 3 times in same place, yo, pull through first 3 loops on hook, yo pull through both loops on hook. Row 2: Ch 1, sc in each of first 2 sc, *cluster in next sc, sc in each of next 2 sc; rep from * to last sc, cluster in last sc; turn. Row 3: Ch 1, *sc in top of first cl, sc in each of next 2 sc, rep from * to end of row; turn. Row 4: Ch 1, cluster in next sc, *sc in each of next 2 sc, cluster in next sc; rep from * to last 2 sc, sc in each of last 2 sc; turn. Row 5: Ch 1, sc in each of first 2 sc, *sc in top of first cl, sc in each of next 2 sc; rep from * to last cl, sc in top of last cl; turn. 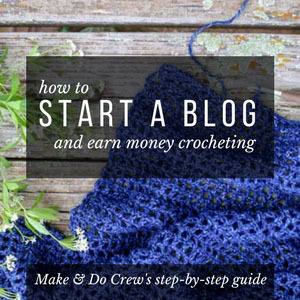 Hbhdc (Herringbone Half Double Crochet): Yo, insert hook into next st, yo and pull through st and first loop on the hook, yo and draw through both loops on hook. Note: Work the final stitch into the top of the tch of each row to maintain a straight edge. Row 2: Ch 2 (counts as 1 hdc), sk first st, hbhdc in next and every hbhdc to end of row, working last hbhadc in tch; turn. Stitch Multiple: 4 sts + 2. Bobble stitch: [Yo, insert hook where directed, yo, pull loop through, yo, pull through 2 loops] 3 times in same place, yo, pull through first 3 loops on hook, yo pull through both loops on hook. Note: Work the sc that follows each bobble quite tightly so that the bobble visibly pops out. Row 2: Ch 1, sc in each of next 2 sc, *bobble in next sc, sc in each of next 3 sc; rep from * until 3 sc remain, bobble in next sc, sc in each of next 2 sc; turn. Rows 3-5: Ch 1, sc in each sc to end; turn. Rep Rows 2-5 until piece measures 18” square. 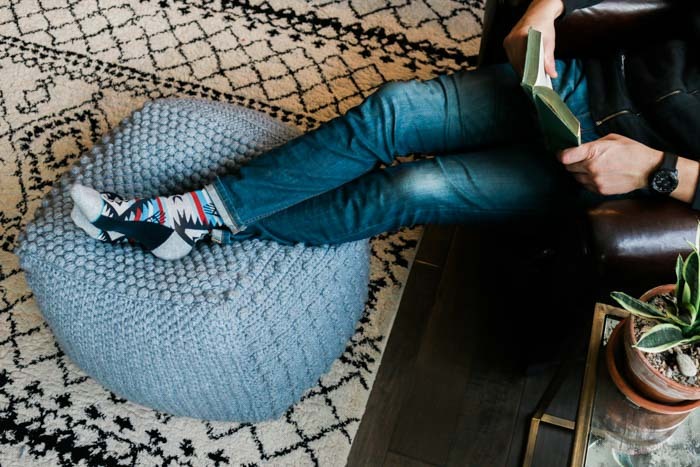 Now it’s time for Part 2 of this free crochet bean bag pattern later where we cover how to block your squares, join them together and stuff your pouf. And if you’d like the pattern in one easily printable place, you can pick up the full pattern (Parts 1 and 2) in the ad-free, printable PDF for $2.75 here. Sweet!! Love it for the little ones to sit and read on!! Thank you for sharing!! Yes! My kiddos are loving playing on it! Looks wonderful. Can’t wait to try this. Please tell me you did not have 3 skeins going at the same time in order to have 3 strands at a time (to obtain the ‘chunky’ yarn effect). I looked for the instructions in this pattern but could not find it. This is such a wonderful project! 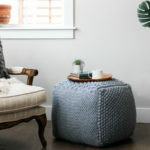 I’ve been thinking about making bean bag pouf in my room since my old one I bought from Target shrunk after being used for…oh I don’t remember exactly but I remember it didn’t last that long. What a fun project! I l really enjoy working with Pound of Love. 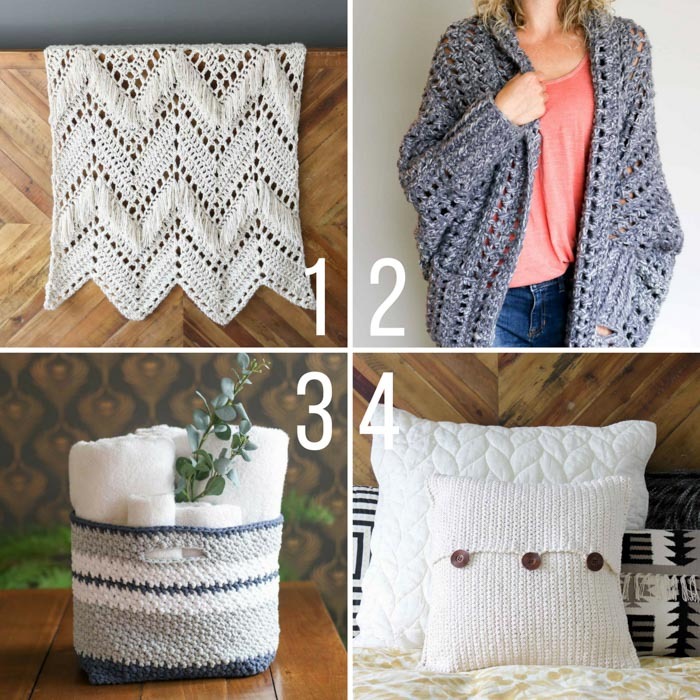 I just purchased the 5 skeins of Pound of Love yarn and am excited to make this! 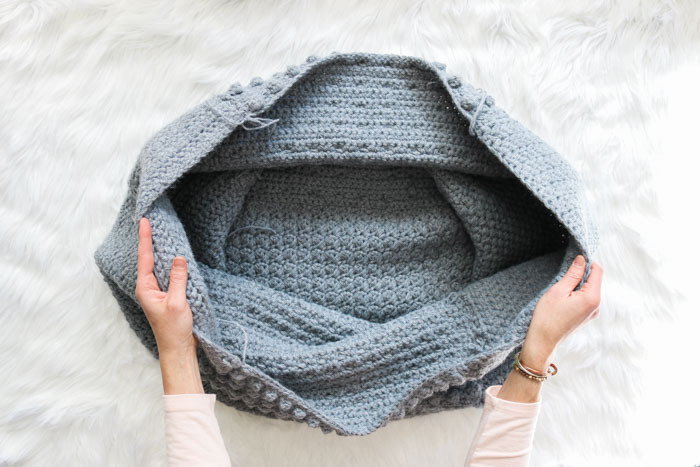 I have a question…when you stated in the instructions that you crochet with 3 yarn’s, how did you do that? Meaning, did you take three of the skeins at one time? Which would leave two skeins. How did it all work out in the end? Thanks for your help. I am a Beginner+ crocheter. 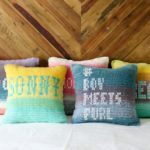 Did you make the pillow in the photo? If so, do you have the pattern? It’s super cute! I have made 5 of the squares and am really having trouble following square #2 uneven berry. I tried to crochet it and diagram it and I still can’t make it work. It may be helpful to write how many berry stitsches need to be made in each row. I’m guessing 20? When I diagrammed it I ended up with 20 then 19 and then 18. Something’s wrong. Another suggestion would be to place a picture along with each square pattern as a way to check if you’re following the pattern correctly. I’m gonna try one more time but if I can’t make it work I will just repeat one of the other squares. That would be very nice! Thanks. Hi, Jess! I think I’ve pinned pretty much everything you do, haha! But I did go ahead and purchase this pattern, as I thought it would be helpful since I’m a beginner. 🙂 The problem I’m having is that my foundation chain is measuring much shorter (around 13” when stretched) than the 18” you said the squares should eventually work up to. I’m using the exact yarn weight and hook size you specify, so I’m not sure what I’m doing wrong. Can you offer any suggestions? I did some research about too-tight foundation chains, and even tried the suggestion of sizing up my hook to an M just for the foundation chain, but that still only gets me to 16” when fully stretched. What else can I try? I hope the answer is that simple, lol. 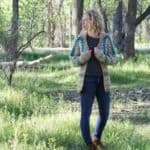 Thanks so much for your support in pinning my patterns!